There’s several lessons here, not all of which have to do with court records. The first image in this post was originally going to be the only one used to illustrate it. When I went to review the image to write the post I realized that there was a name missing: Barbara Bieger. It mattered because that was the name I was looking for. There is a Barbara Fane mentioned and I think she is actually Barbara Bieger. This Barbara lived with her husband Peter Bieger in Warsaw, Illinois, from sometime in 1850 and remained there for the most part until her death in the early 20th century. When I looked at the image there was no Bieger reference. I looked again as I know that Bieger was used as a search term in order to find the reference. I remembered thinking that Fane was a likely reference to Fennan, the last name of Barbara’s “husband” George Fennan with whom she had a relationship for at least part of 1856 shortly after Peter Bieger’s death and to whom she may never have actually been married. But there was no Bieger on the image. Searching for it again (on the “Digital Archives” of the Warsaw, Illinois, Public Library website) I found the reference to Barbara Bieger that had brought me to the image. 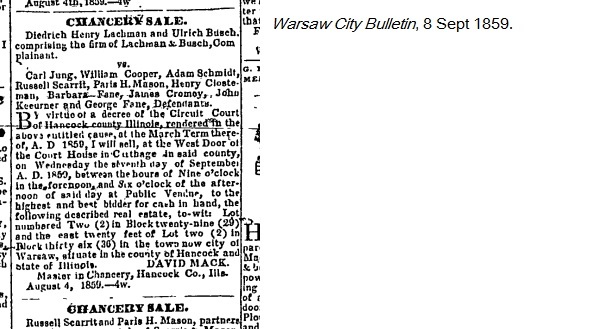 There were two “Chancery Sales” listed in the 8 September 1859 Warsaw City Bulletin. In my haste to make the image I had only copied the first one. 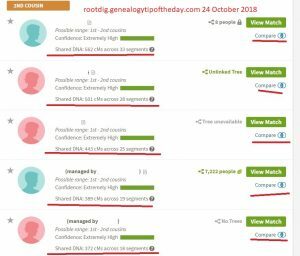 The second court case actually referred to defendant Barbara Fane as “Barbara Bieger or Fane.” The first two lessons in this post are fairly broad ones. Lesson two: it always helps to read other entries on the same page or adjacent pages when one item is located. But there is more than that. I’ve been through the indexes to Hancock County Circuit Court records numerous times looking for court cases on Barbara, using all of her married names–whether those marriages were legal or not. This case is not indexed in the defendants’ index to court records under Barbara’s name or the name of any defendant–except Carl Jung. A little analysis of the records indicates that only the first defendant is listed in the index. That’s why I never came across this case while searching the index. Someday the court records may be available online and completely searchable, but that day is a long way off. I’m not exactly certain why Barbara was being sued and I won’t know that until I look at the records. She did own real property in Warsaw in 1859 that her first husband purchased, but that is not the property referenced here. It is possible that her property bordered the property mentioned or that she had other financial dealing with some of the other defendants. She did run a tavern in Warsaw in the 1850s. The sale ordering the decree was at the March 1859 term of the court. The sale was on 7 September. And yes, the paper is dated 8 September. I double checked. Publishing the notice after the fact does seem a little self-defeating. There should have been notices publicly posted elsewhere. The packet of court papers may address where those notices were posted. But I never would have located this court case if I had not searched for her in the newspapers. I agree that publishing the chancery sale information after the fact seems a bit strange. It is possible that there was a public notice board near the courthouse on which such announcements were routinely posted. Placing a notice there ahead of the date of the sale probably would have satisfied the need for timely notification of the public. I’m guessing that there were public postings at popular places in town. The rationale for the time between the court ordering the sale and the actual sale would be interesting to know as well.